Yesterday was a farmers’ market day and I purchased with my eyes. Nobby purple potatoes, sumptuous lettuce heads, spiky mustard greens and a bouquet of their brilliant yellow flowers. Baby fennel bulbs with frizzy headdresses and a kaleidescope of golf ball-sized heirloom tomatoes. When the produce is this fresh and diverse, I let the ingredients do the talking. I made this potato salad to accompany a grilled garlic and spice rubbed tri-tip. 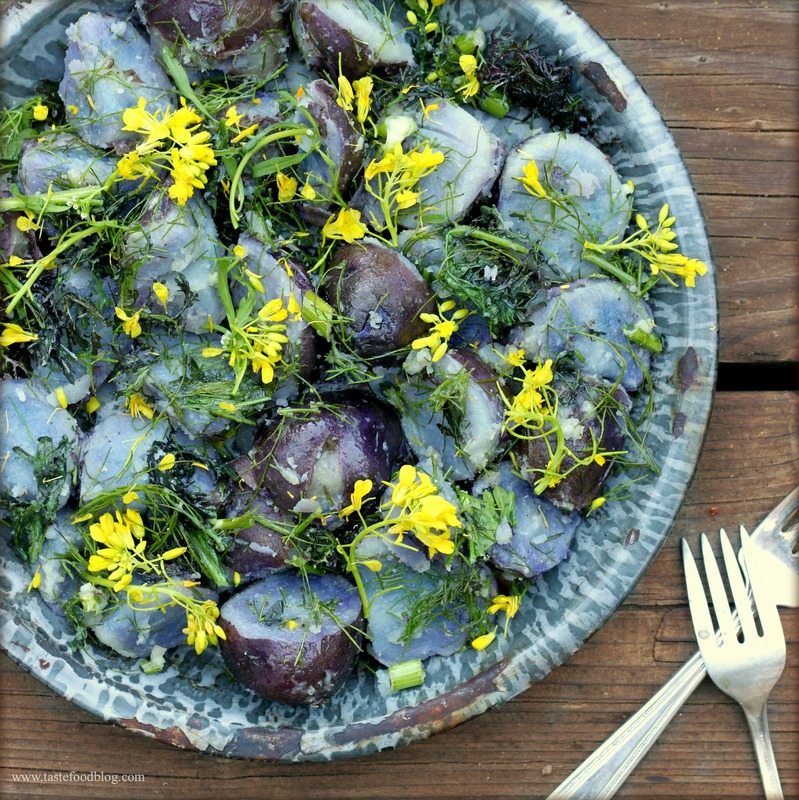 Purple potatoes are beautiful and other worldly, resembling prehistoric stones. Their flavor is remarkably mild and creamy despite their blue tinged flesh. For this salad they were boiled until tender and tossed with handfuls of red and green mustard leaves and the frizzy tops of baby fennel. The heat of the potatoes wilted the mustard just enough to tame its pepperiness and released the anise aroma of the fennel fronds. 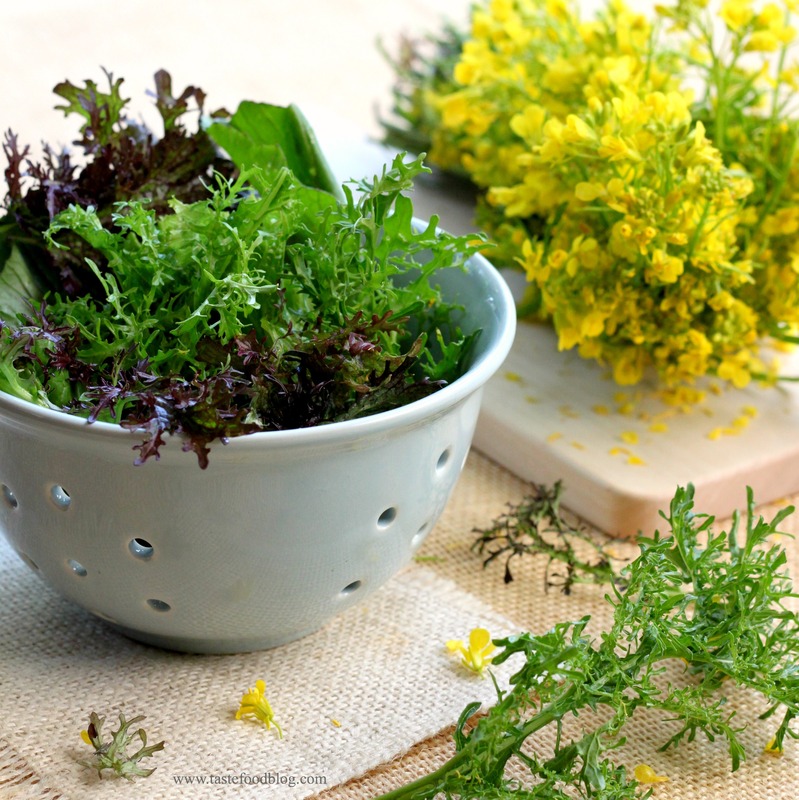 Yellow mustard leaves added a brilliant accent – after all blue and yellow are complimentary colors. The moral of this post is to embrace what you have. Mix and match aromatic herbs such as dill, parsley, mint and chervil to your taste. Any sturdy green is fair game: the warm potatoes will get to work and wilt it into suppliance. Put the potatoes in a large pot and cover with 2 inches of cold water. Add 2 teaspoons salt and bring to a boil. Simmer until tender but not mushy. Drain and cool slightly. Cut any large potatoes in large bite-sized chunks. Place in a large bowl. Add all of the remaining ingredients except the mustard flowers. Toss and taste for seasoning and add more salt to taste. Before serving scatter the mustard flowers over the potatoes. Serve warm or at room temperature. Lynda, another fabulous winner. Before I even saw the picture, I knew this was my kind of food. You’re still one of my favorite food bloggers! Really great, beautiful food, done simply and exquisitely. I have to go buy blue potatoes now. So pretty and surely succulent! I wonder how those mustard flowers taste (mustardy, but in what way…). what a gorgeous dish! the farmer’s markets indeed are bursting with such a carnival of fruits and vegetables now, and I love what you brought home with you. And welcome back home, BTW!!!! In Tahoe right now, but would love to get together when I’m back and hear all about your trip. 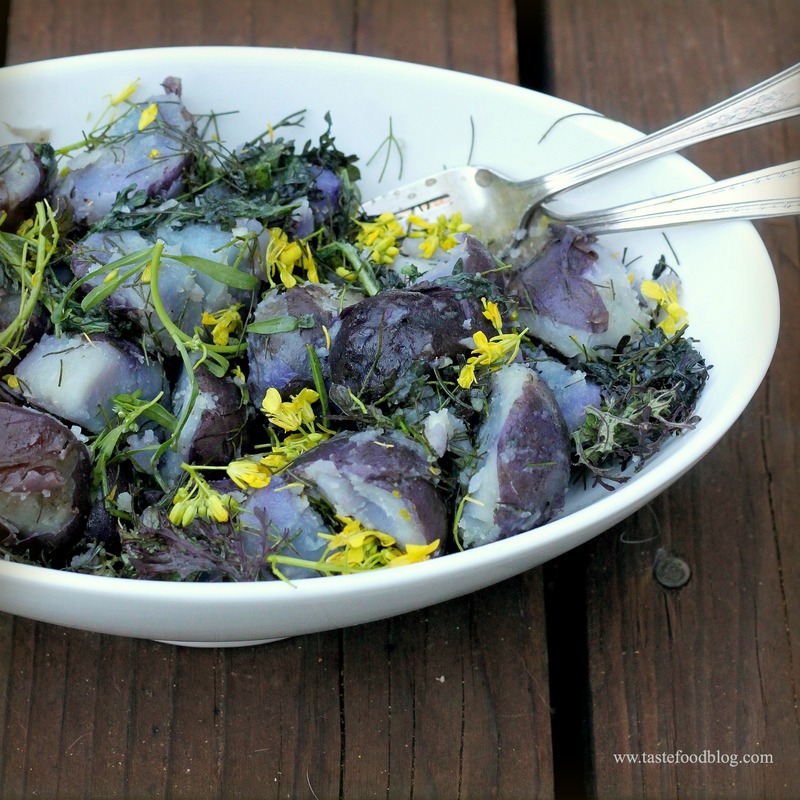 I;ve never seen a prettier potato salad! This is stunning both visually and taste-wise. Great job!! Gorgeous! Love your use of the mustard flowers….simply stunning.